Self-intimidation is a common mental game challenge for hockey players. You lose confidence by making comparisons to your competitors. Most of the time, you’re make negative comparisons, which can make you feel inferior. You might be thinking that the other team is better in terms of their skating ability or defense for example. How do you know if you’re making comparisons? For the Montreal Canadiens in their series with the Penguins, self-intimidation wasn’t a factor. The Canadiens stunned the Pittsburg Penguins with a 4-3 win in the Eastern semifinals to force Game 7. Michael Cammalleri contributed to the win scoring two goals Monday night. “For us, it’s the reality. If you pinch yourself, you’re beat. I remember when you first come in the league if you start sitting around staring in awe and catching flies you’ll be out pretty quick. Now we belong. We’re having fun. For us, hey, we’ve got an opportunity to knock these guys off in Game 7. Let’s go enjoy it and I’ll say the same thing I’ve said every game: ‘Let’s see if we can’t go and play a great game,” said Canadiens Michael Cammalleri. The best solution is to build long-lasting confidence in your game. Players who intimidate themselves tend to lack confidence in their abilities. Think about your strengths as a player. Are you good on offense, anticipating plays, or passing skill? Make a list of these. That way, you’ll remind yourself of your strengths to improve your confidence. You also want to focus on your game. Players have a tendency to focus too much on the competition and psych themselves out. You’ll want to think about your strategy for the upcoming game and what you need to do to be successful today. 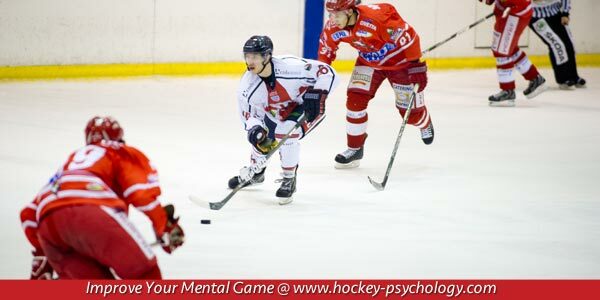 Your hockey psychology tip is to stop making comparisons to other teams or players. Focus on your own game and your strengths. You’ll be better prepared, focused and more confident for the game.